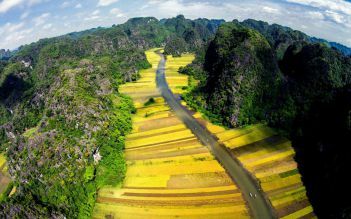 Another new famous site in Northern Vietnam is Pu Luong Nature Reserve – a village home of the White Thai, Black Thai, and Muong Ethnic Minority communities. 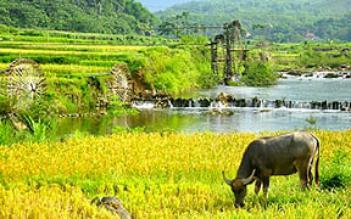 The scenery is well-known for large rice terraces and floating clouds like Sapa but much less touristic. 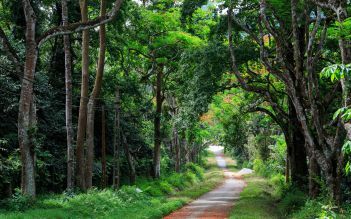 This is a great location for hiking and hard trek through the forest and experience the simple life. 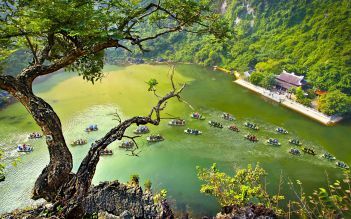 The third day, you will have the chance to learn about the Ancient Capital Hoa Lu, ride on the Historical Sao Khe river in Ninh Binh. You will then cycle between the karst mountains to a local family house to learn about their daily life and customs. 07:00 – 07:30 = Pick-up at Hotel in Hanoi Old Quarter to go to Pu Luong Nature Reserve by Limousine Bus. 11:00 = Stop at the local market of the Muong Ethnic Minority; enjoy the beautiful scenery of Thung Khe Pass (One of the 10 most beautiful passes in Vietnam). 13:00 =Check in and lunch at Pu Luong Eco Garden – The Mountain Retreat. 14:30 – 17:30 = Board the van to the starting point. Following the small road through the terrace rice and sugar cane fields, cross the Hanging Bridges to visit other remote rural villages of Thai Ethnic. Stop at the giant waterwheels, ducks farm to learn about the agriculture before getting on the Bamboo Raft for a relaxing cruise on Cham stream (cruise depending on weather conditions). 17:30 = Pick up the van to go to the Eco Garden – Mountain Retreat. Enjoy swimming in the Infinity Pool. 19:00 = BBQ Dinner at the lodge, enjoy some local rice wine. Have a quiet night in the middle of the Reserve. *Sleeping options: Pu Luong Eco Garden – The Mountain Retreat. Traditional dorm room in the house on stilts or Private Room (no Air-con) or Deluxe Room with Air-con. 07:00 – 08:00 = Have breakfast in the lodge. Enjoying the breathtaking view from Pu Luong Eco Garden – The Mountain Retreat. 12:00 = Back to the Eco Garden – The Mountain Retreat, check out. 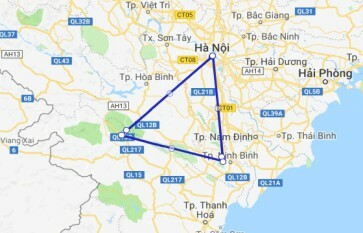 13:00 = Have lunch and have free time to relax in the Infinity pool or walking around the village before boarding the Limousine bus to go to NinhBinh at 14:30. 17:30 = Arrive in Ninh Binh Retreat, check in and have free time. *Sleeping options: Ninh Binh Retreat: Traditional dorm room in the house on stilts or bamboo bungalow (no Air-con) or Deluxe villa with Air-con. 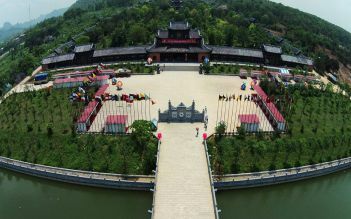 8:30 to 12:00 = Cycling through the limestone karsts to reach 2 temples of the first 2 Emperors in the 10 th Century in Hoa Lu Ancient Capital hike up the Ma Yen Mountain to visit the King’s tomb in 10 th century and enjoy the panorama view from the mountain. On the way back, stop in a local family to discover daily life and culture and share a tea with them. 13:30 -16:00 = Go to TrangAn for a boat ride in between the karst pics and enjoy the beautiful scenery and peaceful atmosphere. 16:00 = Drop you off at NinhBinh Railway station or bus station or board the bus to go to Hanoi. 19:00 = Drop off in Hanoi old quarter. Tour ends. We did the 2 night 3 day trip to Pu Luong and Ninh Binh, it was a wonderful experience to see some of rural Vietnam. Our guide David was excellent, his english was fluent and very knowledgable about all areas we visited. We had 3 lovely days with our guide . We stayed at a beautiful home in Pu Luong, enjoy nature with a trekking and boottour, the same in Ninh Binh. Our guide listens to our wishes and had a lot to tell about everything. SO GOOD! We traveled to Pu Luong and Ninh Binh and we could not ask for more! The scenery, guide, accommodation, food - everything was perfect! We give them our best recommendation!